Hi everyone! Cathy here with you today sharing a layout created with the October Club Q Kit! It features some of my favorite papers from the Baggage Claim collection. I just love the colors and I am drawn to this collection over and over. The kit also has fun Fall chipboard pieces and tags! 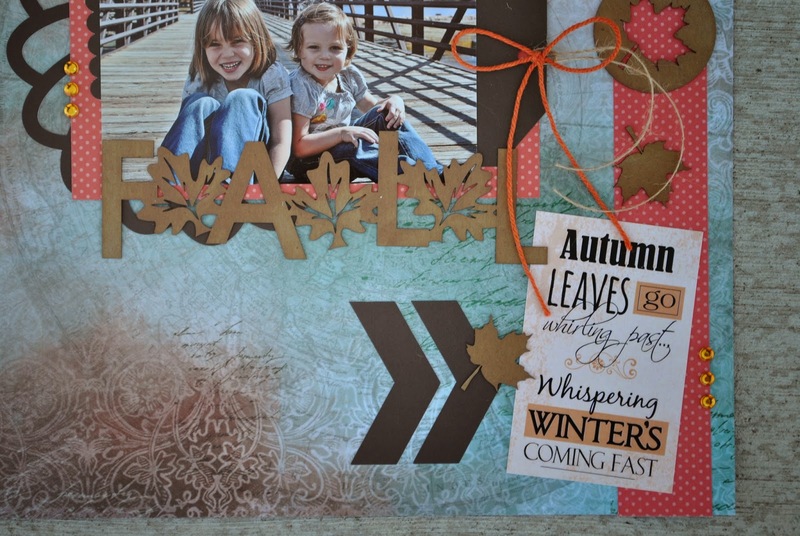 I love the look of the cascading leaves and adding a tag for an extra layer. I inked my Fall Title and leaves with a combination of Rusty Nail and Creamy Cocoa PowderPuff Chalking Inks. It was a very subtle change to the chipboard, but close up you can see the marbling and color that the inks added. I added a few finishing toughed with some arrows, a little twine, a few rhinestones and a great sentiment quote from the kit also! Thanks so much for joining us today at Quick Quotes!